For other uses, see Lobelia (disambiguation). Lobelia (/loʊˈbiːliə, lə-/) is a genus of flowering plants comprising 415 species, with a subcosmopolitan distribution primarily in tropical to warm temperate regions of the world, a few species extending into cooler temperate regions. They are known generally as lobelias. The genus is named after the Belgian botanist Matthias de Lobel (1538–1616). Some botanists place the genus and its relatives in the separate family Lobeliaceae, others as a subfamily Lobelioideae within the Campanulaceae. The Angiosperm Phylogeny Group did not make a firm decision on this, listing the genus under both families. Lobelia is probably the base form from which many other lobelioid genera are derived; it is therefore highly paraphyletic and not a good genus in a cladistic sense. For example, the Hawaiian species (see Hawaiian lobelioids), currently classified in several genera, originated from a single introduction to a now-submerged Hawaiian Island 15 million years ago, probably from an Asian Lobelia in Lobelia subg. Tupa. Lobelia species are used as food plants by the larvae of some Lepidoptera species including the Setaceous Hebrew Character. Several species are cultivated as ornamental plants in gardens. These include Lobelia cardinalis syn. Lobelia fulgens (cardinal flower or Indian pink), Lobelia siphilitica (blue lobelia), and Lobelia erinus, which is used for edging and window boxes. Native Americans used lobelia to treat respiratory and muscle disorders, and as a purgative. The species used most commonly in modern herbalism is Lobelia inflata (Indian tobacco). 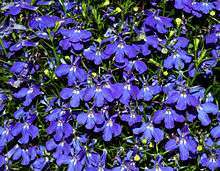 However, there are adverse effects that limit the use of lobelia. Two species, L. siphilitica and L. cardinalis, were once considered a cure for syphilis. Herbalist Samuel Thomson popularized medicinal use of lobelia in the United States in the early 19th century, as well as other medicinal plants like goldenseal. The eccentric New Englander Elias Smith, a preacher and alternative medicine advocate, plagiarized much of Thomson's system. A unique feature of Smith's system was the identification of Lobelia (a.k.a. pukeweed) with the 'plant of renown' referred to in Ezekiel 34:29. Believing that the United States held eschatological significance, Smith believed that this plant was provided by God to democratize medical treatment, just as Smith's preaching was a democratization of theology. One species, Lobelia chinensis (called bàn biān lián, 半边莲 in Chinese), is used as one of the fifty fundamental herbs in traditional Chinese medicine. One unpublished study showed that lobeline—an alkaloid derived from lobelia—is ineffective in helping people to quit smoking after 6 weeks. Extracts of Lobelia inflata contain lobeline, which can reverse P-glycoprotein-dependent drug resistance in certain tumor cell lines in vitro. Lobelia chinensis contains apigenin, lobeline, lobelanine, isolobelanine, lobelanidine, quercetin, coumarins, glucosides and various flavonoids. Because of its similarity to nicotine, the internal use of lobelia may be dangerous to susceptible populations, including children, pregnant women, and individuals with cardiac disease. Excessive use will cause nausea and vomiting. It is not recommended for use by pregnant women and is best administered by a practitioner qualified in its use. It also has a chemical known as lobellicyonycin, which may cause dizziness. About eleven species native to Mexico and Central America have spurs on the flowers. These spurred lobelias appear to form a monophyletic group. Most have been classified in the genera Heterotoma (or sometimes Calcaratolobelia). However, since their closest relatives such as Lobelia anatina are in Lobelia, Koopman and Ayers classify them in Lobelia. Lobelia aurita (Heterotoma aurita). One of the most common understory plants in the Sierra de la Laguna pine-oak forests. ↑ "Genus: Lobelia L.". Germplasm Resources Information Network. United States Department of Agriculture. 1999-01-27. Retrieved 2011-02-03. ↑ "Lobelia". Oxford Dictionaries. Oxford University Press. Retrieved 2016-01-21. ↑ "Lobelia". Merriam-Webster Dictionary. Retrieved 2016-01-21. ↑ Lammers, Thomas. "Revision of the Infrageneric Classification of Lobelia L. (Campanulaceae: Lobelioideae)". Annals of the Missouri Botanical Garden. 98: 37–62. doi:10.3417/2007150. 1 2 Huxley, A., ed. (1992). New RHS Dictionary of Gardening. Macmillan ISBN 0-333-47494-5. 1 2 RHS A-Z Encyclopedia of Garden Plants. United Kingdom: Dorling Kindersley. 2008. p. 1136. ISBN 1405332964. ↑ Craig C. Buss; Thomas G. Lammers; Robert R. Wise; Craig C. Buss; Thomas G. Lammers; Robert R. Wise (2001). "Seed Coat Morphology and Its Systematic Implications in Cyanea and Other Genera of Lobelioideae (Campanulaceae)". American Journal of Botany. 88 (7): 1301–1308. doi:10.2307/3558341. JSTOR 3558341. PMID 11454630. ↑ "RHS Plant Selector - Lobelia x speciosa 'Fan Orchidrosa'". Retrieved 22 May 2013. ↑ "RHS Plant Selector - Lobelia x speciosa 'Fan Scharlach'". Retrieved 22 May 2013. ↑ "RHS Plant Selector - Lobelia x speciosa 'Fan Tiefrot'". Retrieved 22 May 2013. ↑ "RHS Plant Selector - Lobelia x speciosa 'Fan Zinnoberrosa'". Retrieved 22 May 2013. ↑ "RHS Plant Selector - Lobelia x speciosa 'Kompliment Scharlach'". Retrieved 22 May 2013. ↑ "RHS Plant Selector - Lobelia x speciosa 'Pink Elephant'". Retrieved 22 May 2013. 1 2 "Lobelia". EBSCO Complementary and Alternative Medicine (CAM) Review Board. January 2006. Retrieved 2007-09-12. ↑ "Risky pills: Supplements to avoid". Consumer reports. 73 (1): 46–7. 2008. PMID 18488285. ↑ Guédon, Marie-Françoise (2000). Sacred Smudging in North America. Walkabout Press. ↑ Lancaster, T; Stead, L; Silagy, C; Sowden, A (2000). "Effectiveness of interventions to help people stop smoking: findings from the Cochrane Library". BMJ (Clinical research ed.). 321 (7257): 355–8. doi:10.1136/bmj.321.7257.355. PMC 1118332 . PMID 10926597. ↑ Horton, D. B.; Siripurapu, K. B.; Zheng, G; Crooks, P. A.; Dwoskin, L. P. (2011). "Novel N-1,2-dihydroxypropyl analogs of lobelane inhibit vesicular monoamine transporter-2 function and methamphetamine-evoked dopamine release". Journal of Pharmacology and Experimental Therapeutics. 339 (1): 286–97. doi:10.1124/jpet.111.184770. PMC 3186287 . PMID 21778282. ↑ Ma Y, Wink M (Sep 2008). "Lobeline, a piperidine alkaloid from Lobelia can reverse P-gp dependent multidrug resistance in tumor cells". Phytomedicine. 15 (9): 754–8. doi:10.1016/j.phymed.2007.11.028. PMID 18222670. ↑ Chen, J. X.; Huang, S. H.; Wang, Y; Shao, M; Ye, W. C. (2010). "Studies on the chemical constituents from Lobelia chinensis". Zhong yao cai = Zhongyaocai = Journal of Chinese medicinal materials. 33 (11): 1721–4. PMID 21434431. ↑ Chen, M. W.; Chen, W. R.; Zhang, J. M.; Long, X. Y.; Wang, Y. T. (2014). "Lobelia chinensis: Chemical constituents and anticancer activity perspective". Chinese Journal of Natural Medicines. 12 (2): 103–7. doi:10.1016/S1875-5364(14)60016-9. PMID 24636059. ↑ Yang, S; Shen, T; Zhao, L; Li, C; Zhang, Y; Lou, H; Ren, D (2014). "Chemical constituents of Lobelia chinensis". Fitoterapia. 93: 168–74. doi:10.1016/j.fitote.2014.01.007. PMID 24444893. 1 2 "GRIN Species Records of Lobelia". Germplasm Resources Information Network. United States Department of Agriculture. 1999-01-27. Retrieved 2011-02-03. ↑ "Lobelia". Integrated Taxonomic Information System. 1 2 Koopman, M. M.; Ayers, T. J. (2005). "Nectar spur evolution in the Mexican lobelias (Campanulaceae: Lobelioideae)". American Journal of Botany. 92 (3): 558–62. doi:10.3732/ajb.92.3.558. PMID 21652434. ↑ Díaz, Sara C.; Touchan, Ramzi; Swetnam, Thomas W. (2001). "A tree-ring reconstruction of past precipitation for Baja California Sur, Mexico". International Journal of Climatology. 21 (8): 1007–1019. doi:10.1002/joc.664. Dressler, S.; Schmidt, M. & Zizka, G. (2014). 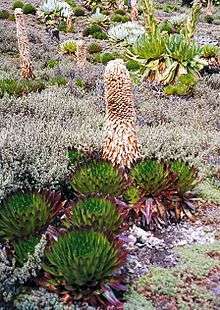 [http://www.africanplants.senckenberg.de/root/index.php?submitForm=true&page_id=77&searchTextMenue=Lobelia&filterRegionIDs=6&filterRegionIDs=1&filterRegionIDs=2&filterRegionIDs=3&filterRegionIDs=5 "Lobelia"]. African plants – a Photo Guide. Frankfurt/Main: Forschungsinstitut Senckenberg. Wikimedia Commons has media related to Lobelia.